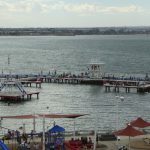 Back in the 1920s and 30s, the Victorian coastline must have been dotted with swimming enclosures like the one at Geelong’s Eastern Beach. 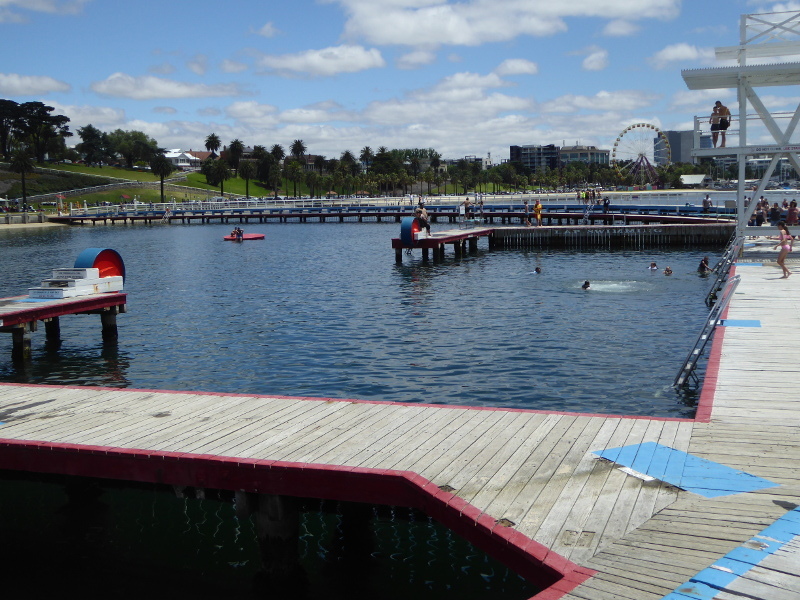 Unlike in NSW, where I recently completed my quest to swim in all the 100 or so salt water baths and enclosures, Victoria got rid of pretty well all of them. To the best of my knowledge, Geelong’s wonderful art deco enclosure is the last remaining in the whole state. 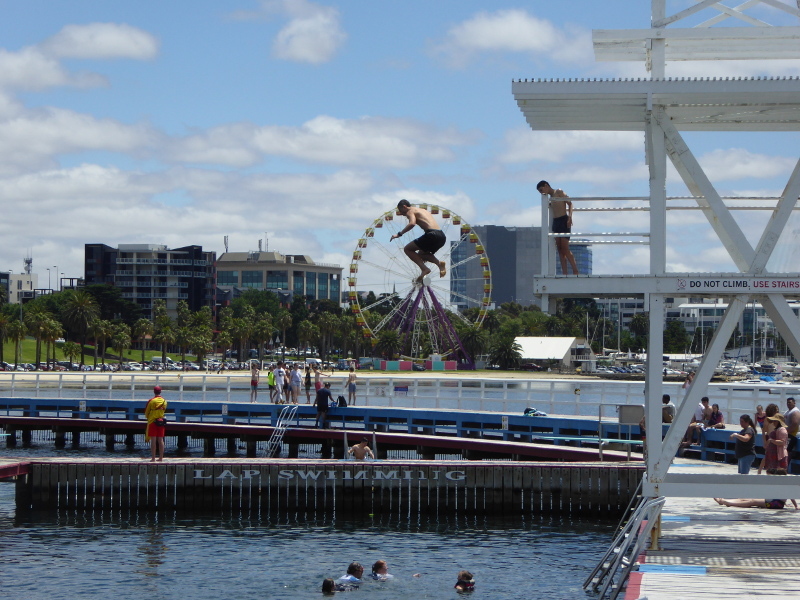 So Geelong is not only going to be a repeat destination on Vintage Victoria because of its other vintage venues, but whenever we feel like a dip in sea water on a hot day, it will still be our go-to place thanks to the Eastern Beach Baths or ‘Promenade’, as some seem to call it. 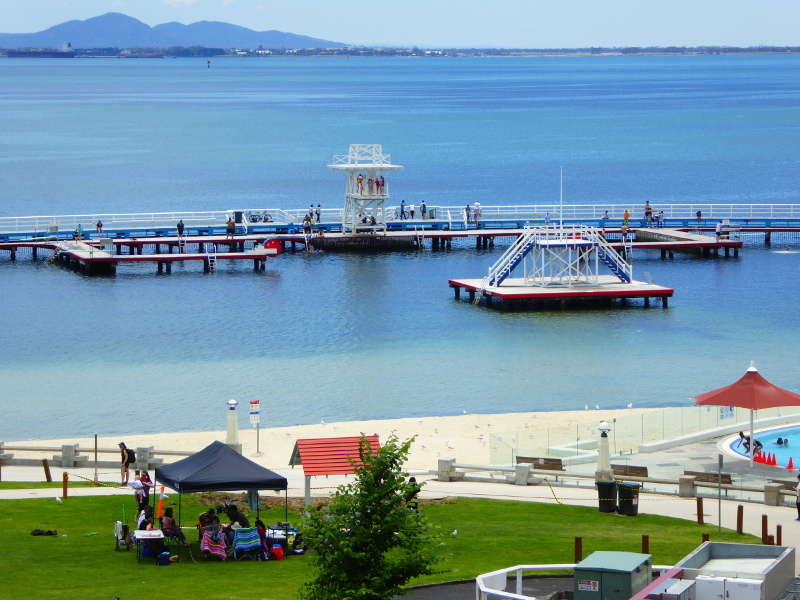 This is a vast expanse of water, protected by a big semi-circular ring of shark netting, with a double-levelled wooden walkway around the edge. 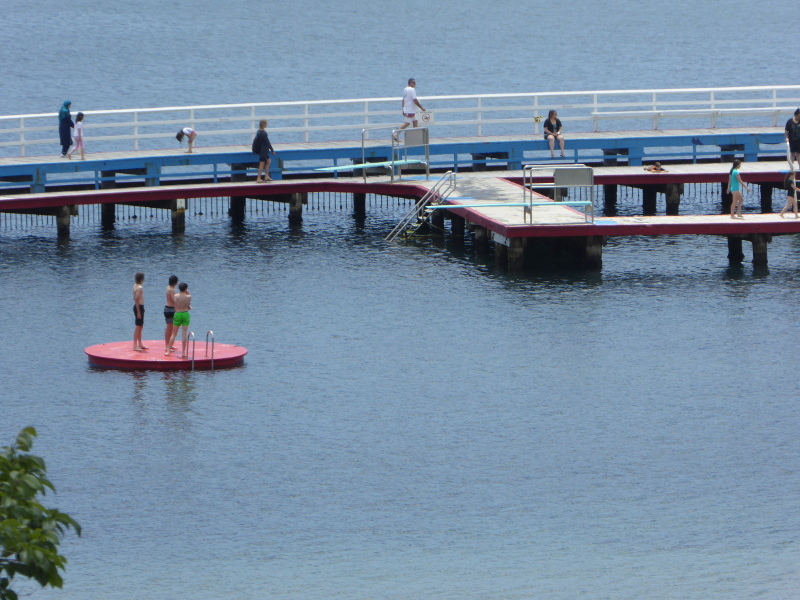 We have tended to access the water from the sandy beach and swum up to the deeper section where there is a 50m pool, diving board (still in use all day long), and old-fashioned pontoons to swim to and jump off, including one rolling cylinder which looks a bit of an effort to get into position, but great fun to plop into the water from (though everyone we saw using it seemed to land on their back, which is probably not the best way to enter the water). 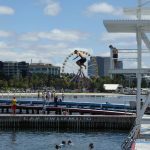 You can take the more leisurely option of getting in via the boardwalk, which has several metal staircases into the water. We have actually used them to get out after our laps, and they can be a bit slippery and steep, so take care if you use them. At low tide there is a fair bit of sea grass in the water here, but I’ve swum in a lot worse in some of the NSW ocean pools so that didn’t bother me in the slightest. In mid-summer, though, we were rather alarmed as we swam headlong towards a beautiful (but possibly not too friendly) purple jellyfish, which thankfully A. saw in time for us to take evasive action, as my poor vison would have meant swimming straight into the thing. The waves on Port Phillip Bay can also mean a bit of a swell flows into the baths some days, but you wouldn’t call it surf so there’s no rip, and anyway the shark net would stop you if you did drift out. But the waves make it fun to swim in sometimes. It’s just a great spot to watch people having fun in good, old-fashioned ways, and as I often said in NSW at the ocean pools: it’s all free! The setting is beautiful as well. 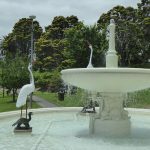 The children’s pool looks inviting, the storks in the fountain are pure vintage, the Spanish staircase up the hill gives it a dramatic exit (or entrance), and even the lifesize sculptures of bathers dotted around the area are fun and decorative. 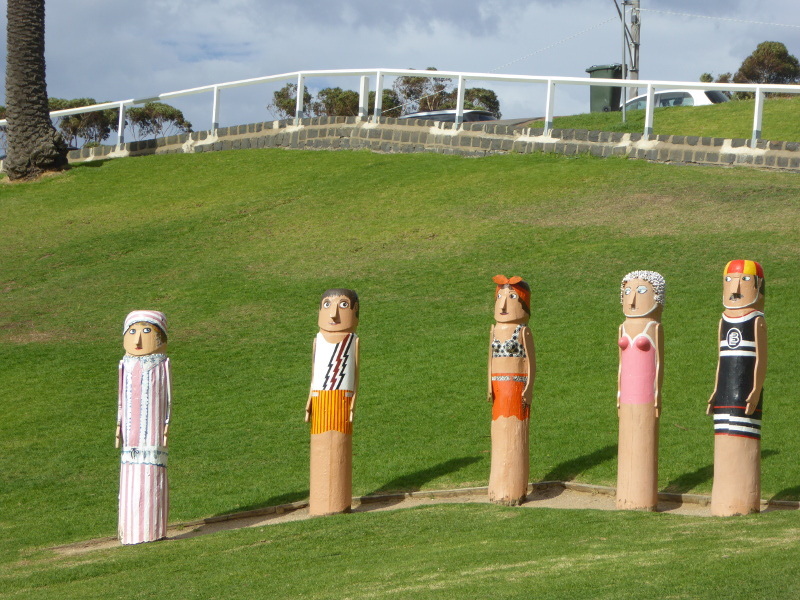 And above all, I love the mix of community who comes down to Geelong Eastern Beach. People of all ages and all ethnicities seem to gravitate down here. Makes me realise fun is a very multicultural thing. Long may it continue. 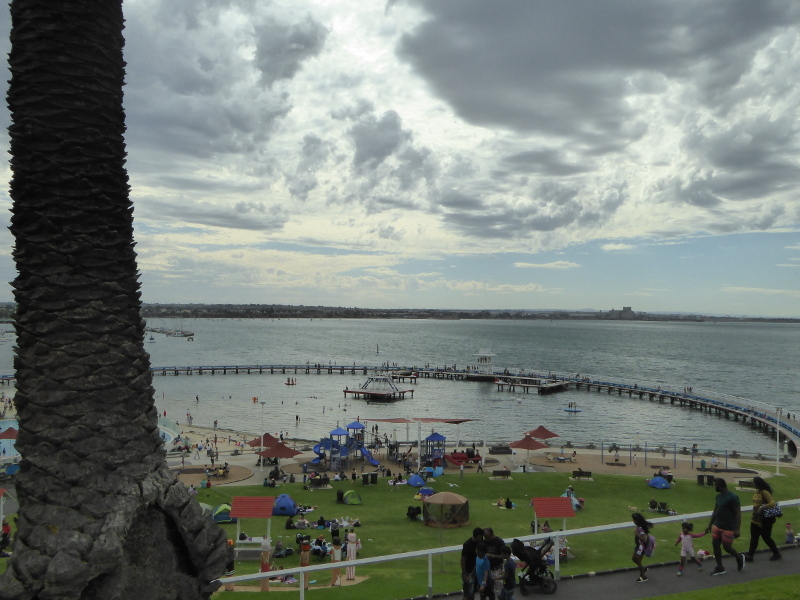 And Geelong Eastern Beach: we’ll be back soon. On a hot day in summer, parking can be tricky, but we discovered ample parking a couple of hundred metres away by the Botanical Gardens. 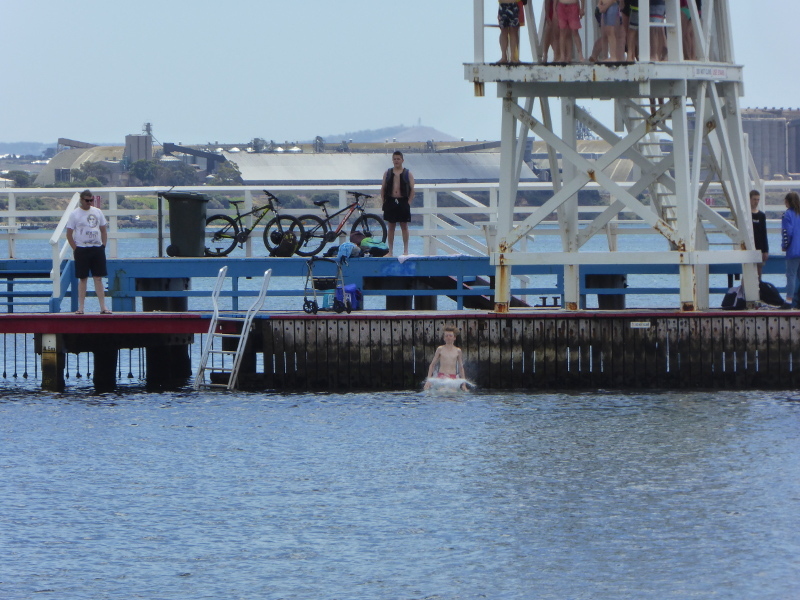 Then saunter down the slope to the water and take the plunge. Showers, toilets and changing facilities good but can get busy on hot days, so I have had to wait for a shower after my swim. 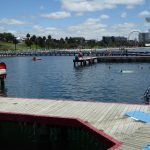 Open all year round, which is virtually unheard of in swimming venues in Victoria, but there are no fences or barriers to stop anyone getting into the water whenever they want. Some locals I have spoken to argue the water is dirty, but I would say it felt fine to me, and the only time I would avoid the place would be after heavy rainfall, but that would be the same for most open water swimming spots. 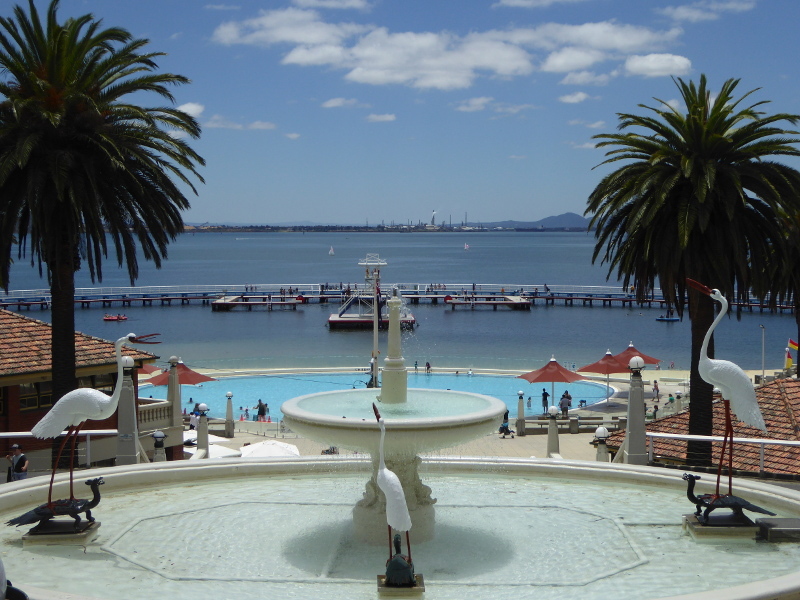 There was swimming in Corio Bay before these magnificent baths were built in the 1920s, but swimming in those days was gender-segregated, and when discussion started around providing better bathing facilities for the town, ‘mixed bathing’ was clearly on the agenda. I loved the clipping from the Geelong Advertiser of 20 April 1922, when the Mayor at the time called on travellers to look out for ideas of modern baths and bring back plans and photographs if they could. What a great request, especially added to his comment that Geelong had ‘money to back enthusiasm’ and wanted ‘baths equal to any in the Commonwealth’. Good on yer, Alderman Hitchcock. 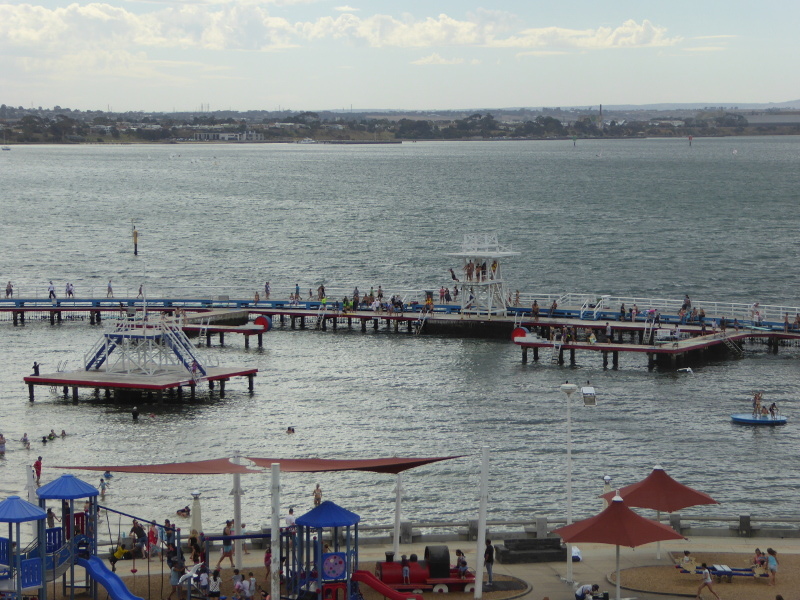 There was controversy, though, before the new facilities were built, as some pushed for better shipping access to Geelong, using the Eastern Beach more for commercial purposes. 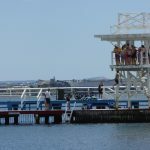 Interestingly, one correspondent argued that there was an age divide, with older people tending to favour the transport hub, while it was the ‘young and those in the prime of life who take part in sea-bathing’. 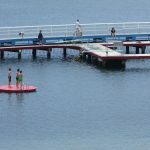 Interesting because the debate reminded me of Brexit in the UK, but also because over in NSW the ocean pools are used much more frequently by older people than the younger crowd. Geelong in 2018 might just be an exception to that, mind you. The work went ahead, though, with the main structure opening in 1929, and further developments unfurled over the next ten years. Amazingly, I found no press clippings relating to the opening itself, though. I guess that may be my search words, or maybe Trove for once not having full digitisation of articles from the time. Can anyone help with this? 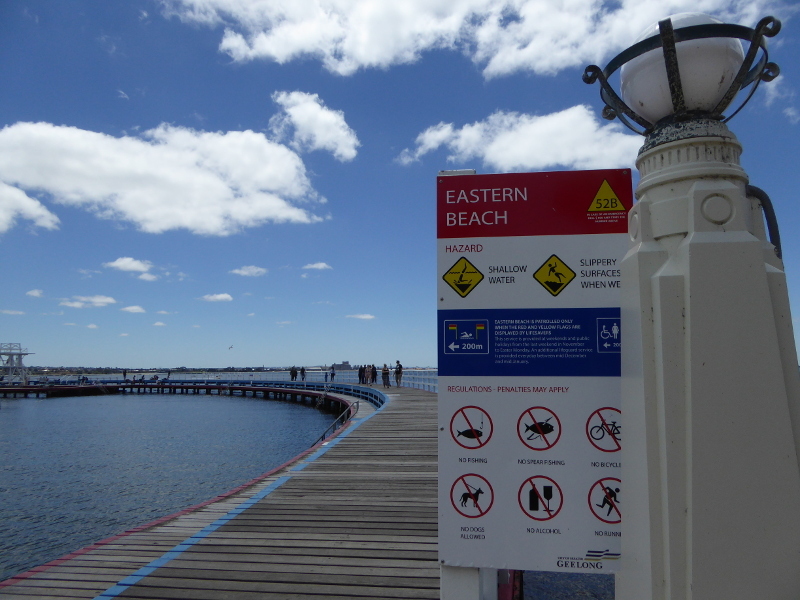 There was a 1939 competition to decide on a name for the Eastern Beach bathing area. 250 suggestions were whittled down to 6, according to newspaper reports, but what was the final decision? 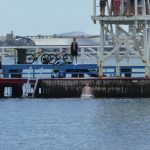 Eastern Beach Swimming Enclosure? No news reported on the outcome. Anyone know? 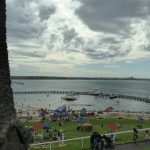 I loved the quote from PM Menzies in 1947, praising improvements at Geelong’s Eastern Beach, saying that when he was a small boy Eastern Beach was ‘something of an abomination’! 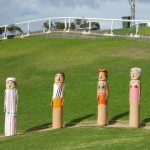 In those heady days of swimming and outdoor pursuits, there was talk of copying Geelong in other spots along the coast, like South Melbourne and Queenscliff. I’m not sure any of them saw the light of day, but if they did, they’re all gone now, sadly. 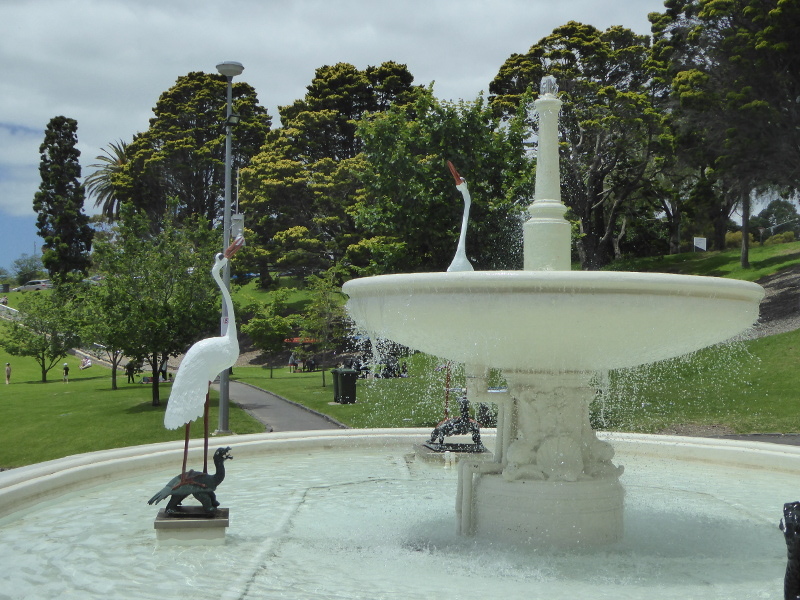 In 1956, the local council renamed a street the Ritchie Boulevard, in memory of the Mayor of Geelong in 1924-25 who had instigated the Eastern Beach building project. Interestingly, that gentleman’s grandson added a comment to one of the blogs I found (below) recalling his family connections to this great place. 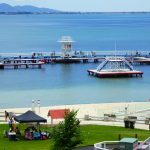 As with many pools like this (also in NSW), from the 1960’s Eastern Beach started to become less popular, and by the 1980s, there was talk of closure as the boardwalk promenade had become dangerous. But in 1993, the local council invested in a complete refurbishment, which left us with the beautiful facility we still have today in 2018. And judging by the crowds there when we visit, that was a great decision, well made. 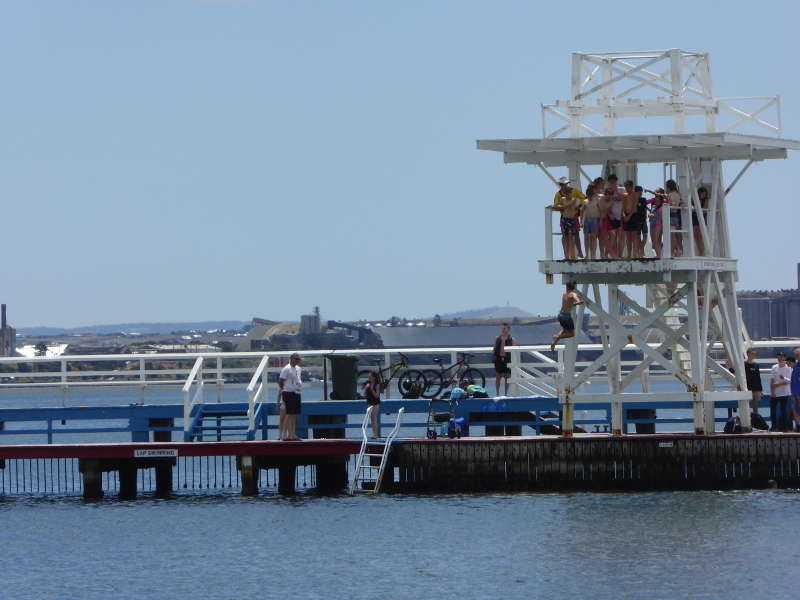 This is the Geelong Tourist Information Office take on the Eastern Beach Swimming Enclosure. 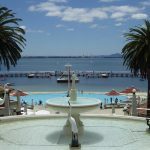 This post has some fantastic insights on the history of the bathing area at Eastern Beach. 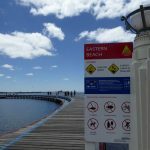 What are your memories and stories about the Eastern Beach Baths? Did you swim in the enclosure – or walk along the Promenade as a youngster in the past? Do you still love this place today? Any exciting stories to tell? Can anyone remember how it was before the renovations carried out in the 1990s? And any stories linking back to those two mayors of Geelong who did so much to help have the baths established and maintained? Best coffee in Geelong? My choice so far is back in the main shopping streets of the city centre so a bit of a hike (but not too bad once you’ve been refreshed by your swim). We loved going to the beach baths as a child. And these days it’s even better – the whole foreshore development since the 90s is just lovely. And it’s so well used by the crowds, especially on warm days!